Notes: This is an original anime. There is also a manga written by Naotaka Hayashi (who basically wrote the story for the anime) and Illustrated by Yūyū. The manga is serialized in Dengeki G's Comic. After failing to get into college (for medical reasons, supposedly), Tsukasa Mizugaki is handed a job at SAI Corp's Terminal Service, collecting android humanoids -- called Giftias -- when their time is about to expire. The corporation is the ones who created the Giftia, but while Giftia themselves are made more or less indistinguishable from regular humans, they come with a life span very much set in stone -- nine years and four months -- after which their personality core basically disintegrates and there's a very significant chance that they'll turn into supernaturally strong killer robots. Plastic Memories isn't the first show I've seen that delves into humanoid robots and their capacity for emotions, more specifically love. I did a second opinion for Chobits some time ago that sort of went into the subject, though not entirely in the same manner. Hell, I've even recently reviewed a movie called Time of Eve, that neatly subjected us to the relationship between human beings and their own constructs, that felt far more rewarding than this show. Plastic Memories is also about death, more or less. In a weird inversion, the limited timespan of our android residents means that human beings almost always outlive them. And so, the Terminal Service comes into play, as an attempt to give the Giftia a somewhat dignifying end and also to ensure that none of them go crazy and severely hurt or even kill anyone. See, what happens when a Giftia's... soul? ...expires, their personality basically dies out, leaving the robot body with functionality for movement but nothing else. The show just tells us this, though, without really explaining why it works like that. There is also another thing that may happen that I'll go into a little bit later, so look forward to that. And try not to imagine me rolling my eyes too hard. I have many, many problems with this show. Some rather immediate ones, and some that will come to light later on. One of the more immediate ones is the show's attempts at comedy. Plastic Memories whips up some pretty tired stereotypes to the table, and while the female ones are particularly irksome, the male ones are not far behind. Michiru in particular is most tsundere jokes rolled into one intolerable ball of verbal abuse and wild accusations, and you will pretty much rue her every appearance in this show, because rarely will anything good come of it. She constantly berates the main character whether he deserves it or not, and even admits to it later. It probably doesn't help that her Giftia partner, Zack, also takes every opportunity he can to tease her about. Kazuki isn't much better. She has a tendency to physically assault her coworkers, up to and including her own boss, and actually threatens her own staff at times. She's also a terrible drunk and has problems taking no for an answer, which often leads to bad situations, as does her unwillingness to tell people things they need to know to be at their most effective, mostly because the show somehow considers the revelations too early for the viewers, and that's just bad writing. It makes the show, and her character by extent, irritating to have to deal with, because it's not like the things she could've said are things that needs to be kept a secret. And lastly there's Eru Miru, who isn't a retriever, but an engineer at the company. And also your garden variety female pervert. It doesn't help that most of the male characters, at least insofar as those who work in the company Tsukasa lands in, are a bunch of dumbass "originals". Takao Yamanobe is the head of the company, who doesn't exactly exude a commanding presence; not by his coworkers nor by his daughter (whom we never really get to meet.) Yasutaka Hanada, on the other hand, is a lazy bum who's somehow managed to work himself up to a veteran status in the company, lord knows how. The most tolerable of the male characters are Mikijiro Tetsuguro, who plays the part of the cranky old man engineer, who actually DOES command some respect. Even Tsukasa is your general dogged "nice guy", and the comedy is far too busy with making his job a miserable affair. Episode 3 is the absolute nadir at this, as it's mainly about Tsukasa moving into Isla's apartment. Being unable to handle that, he keeps looking to and taking incredibly stereotypical advice from his coworkers and screwing it up, because the show wanted to say "Hey, isn't jokes where something gets messed up, and someone else walks in at the most embarrassing moment and completely misinterprets the situations really funny? Then, why don't we just do that repeatedly?" In fact, it seems like the Giftia are the ones who won the personality lottery, because they're the only ones who are acting somewhat reasonably, not counting Zack's mischiveous troublemaking. Constance is calm, collected and even somewhat helpful, a rarity in this show. There's also Ren, one of the background fixtures. I think he's human, but I'm not entirely sure. He doesn't really do a whole lot in this show. The main draw, Isla herself, is a bit of a conundrum. She is the first character Tsukasa meets, as she's standing in an elevator crying while watching a ferris wheel in the distance through the elevator's glass wall, and for most of the time after this scene, she'll serve as the show's comedic foil. She's also the main evidence of the strangely divisive tone of the show itself; apparently, she's their top operative retrieval staff, or so the show tells me, but she spends literally every single moment on the job before her... "switch"... screwing things up in both "comical" and highly slapstick-ish ways, which makes her switch into thoughtful and supportive romantic interest later on bizarre, to put it mildly. If you think it's strange of me to go so heavily into the characters right off the bat, well... that's just how this show rolls. Tsukasa meets up in his new work office and is immediately thrown into his work without much of a chance to learn the ropes. (With accompanying verbal abuse from Michiru... because she's tsundere and really likes the guy, see?) There is certainly a sense of nepotism about how Tsukasa got his job, and while that is critiqueworthy by itself, it's not unheard of in the real world either, so I'm going to let that one slide. The show also leads off with a few Giftia retrievals, mostly to put the whole Giftia's limited lifespan thing into the viewers minds. Unlike humans, they remain pretty much unchanged through their nine years of life, and some of them even take the shape of teenagers or children. The concept of retrieval can and probably will come across as a bit ridiculous when you see the first one, where an elderly couple bids their farewells to a seemingly healthy human being in his late teens or early twenties. But while ridiculous, I did give the show the benefit of doubt in that it was made to show the business-like aspect of it all. The second retrieval, however, was a bit of a challenge and is, with the possible exception of the ending of the show, what you could arguably call the most honestly emotional the show gets, however manipulative. And then, at the peak of emotional swell, they ruin the whole thing with a pee joke. Hey, I told you the comedy in this show was terrible, didn't I? The concept around the whole company is Giftia retrieval, yes, but the reason for the need for this is basically one of the big elephants in the room. The way the Giftia are made -- that is to say, their vague representation of a personality; a soul, if you will -- is that they've got a limited life span, and you do not under any circumstance want them to remain active after it runs out. If you're lucky, you'll merely end up with a catatonic android whose sole remaining ability is "moving around". However, it's also very likely that any Giftia that remains activated past their time will go berserk. They have a self-imposed limiter set to their physical attributes that will be deactivated, and then they'll basically go berserk and attack people. So, before that can happen, the company collects them while giving the family a chance to come to terms with it. And this is where my reality matrix started breaking down. See, this is something that has already happened, repeatedly, despite the show's insistence that it "very rarely happens". And furthermore, given the way the Giftia are built, they're basically alive -- they can shed tears, and even get hurt and bleed -- almost to the point where they're made to connect emotionally with people, meaning that, as the first episode and several following ones show us, not everyone will want to return their Giftia partners once the time comes. That could have been enough for drama purposes; that the Giftia just become catatonic walking corpses, but this berserk mode aspect just feels like a severely illogical addition when you put it in sales terms. "Please buy our robots. But make sure to give them back after nine years, or they might go berserk and severely hurt or even kill somebody." Are the customers actually told this before they get themselves a Giftia, or are they left to deal with the fallout on their own? And whether they are or not, and given how many of them are unwilling to return their Giftia, how is this world not overrun by robotic rage zombies already? It's this confounding disconnect that really takes me out of the show. Even more so once I learned that the company Tsukasa works for is constantly in trouble with the head company for economical reasons; their overhead is just too large. And how? Because they wanted to give their customers more time to come to terms with the... uh, retrieval process... instead of going by the "Time's up! *YOINK*" method. I get that the show is trying to represent a customer-friendly attitude -- I can even appreciate this -- but the bizarre way this show goes around with it just makes no sense. Nor does the subplot with the black market retrievers that doesn't really go anywhere except to serve as an example of "when robots go bad", and then forgotten about completely. Just as idiotically, the company who produces the Giftia are never called out on their terrible business practices, while the show hilariously tries to make an army-like private security force across as the closest this show has to "bad guys" when they're seemingly constantly has to deal with the consequences of SAI's reprehensible business practices. Sure, in the flashback, they do come across as a bit trigger happy, but the present scene involving them, particularly with their commanding officer, makes them come across as the most reasonable ones of the lot, even when Kazuki blackmails him emotionally. And that aggressive and militaristic behavior can probably be understood a bit better when you see what a Giftia that has succumbed to the rage is capable of, which you will. In all fairness, the show does have its moments, even if it's trying its damnedest to ruin them with inappropriate jokes, annoying stereotypes, character types and forced tearjerking. It's like... its messages are sound and relatable, but laid out with a complete disregard for logic and common sense, or even proper company behavior. 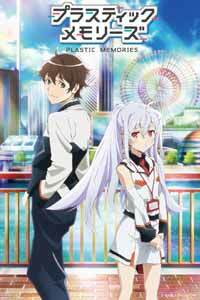 Once Plastic Memories nears its end, the show (presumably) goes into what it intended all along; the love story between Tsukasa and Isla. As romantic stories between two people where one is... sorta terminally ill, in a metaphorical way... it's actually kind of uplifting after all this ridiculous crap that the viewers had to endure up to that point. The show handles it surprisingly well, with more forthright honesty that quite frankly makes the preceding episodes come across as even more ridiculous than ever. Where they would play up Isla as a clumsy moe archetype that does a lot of predictable things, now she's suddenly a fully functional being who can actually read people and react in a believable, if overtly theatrical, way, while Tsukasa sheds most of his needless "loser" behavior. While nice, this just adds another weird disconnect that does not play in Plastic Memories's favor. Nice, but too little, too late as far as this show is concerned. Plastic Memories is not the first and won't be the last show that's got a pretty nice budget thrown at it. I've often been rather annoyed with beautiful shows before, like Ano Hana or Ano Natsu. While I don't think the art -- or rather, the character models -- are all that special, the animation is pretty good, and the show has a rather nice sense of style when it comes to backgrounds as far as painting it in a sci-fi setting goes. It's very clean and futuristic in a vaguely believably way, and it's clear that the show's creators have had lots of practice in animating liquids, like the rain happening in the saddest scenes, or the tears when someone is crying, even if they are almost literally crying buckets. And even if they're not, their faces are as expressive as needed. Sadly, the show's insistence of getting in the way of itself ensures that getting any enjoyment out of this means ignoring a lot of what it puts on its plate, and the audience should never have to do something like that. Ever. Recommended Audience: There is some mild fanservice going on here, though nothing to get concerned about. The violence is a little stronger, mostly in the scenes where the Giftia go berserk and severely hurt someone, though even that is played out more dramatically rather than visually. Technically, the show is safe for most teenagers that are willing to waste time on it.